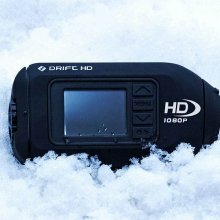 The Drift HD 1080p Action Camera lives in a world that seems to be overwhelmed by Go Pro and to a lesser extent Contour. It has a unique design and comes with many accessories at no extra charge. It also has less of a fish eye perspective so it doesn’t make that steep chute look like a beginner run. The biggest thing about the Drift is the versatile mounting and filming options. You can wear it on your helmet one run, put it on a mono-pod the next and then give it to your buddy to wear on his goggles. It is also the only camera that has a very useful zoom for filming your friends. The only issue is its video quality isn’t as good as the competitors. Update 2015: At the time this was a great option but these days it’s not quite the cam that the newer ones are. The Drift HD Action Camera has a few unique features. It comes standard with a built in display so you can view your videos on the chair. You can change the zoom angle when filming which is huge! You can film at a wide angle when filming yourself and zoom it in when filming a friend on a mono-pod. It’s easy to remove the camera from your helmet goggles or mono-pod because it has a clip. 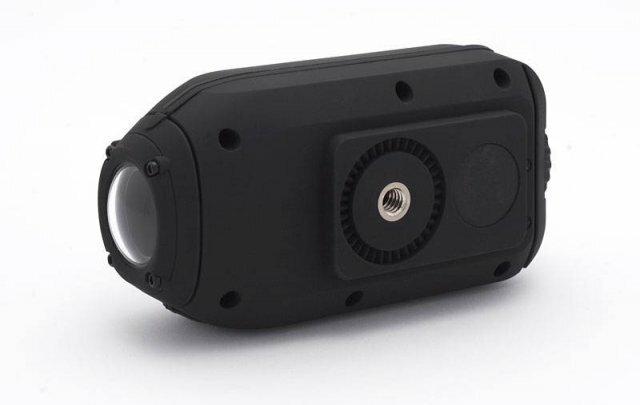 It has a lens that can rotate to accommodate any mounting angle you want to achieve. It comes with a built in screw for almost any kind of mount. It comes with multiple mounting kits. We wish it came with a mono-pod as well. 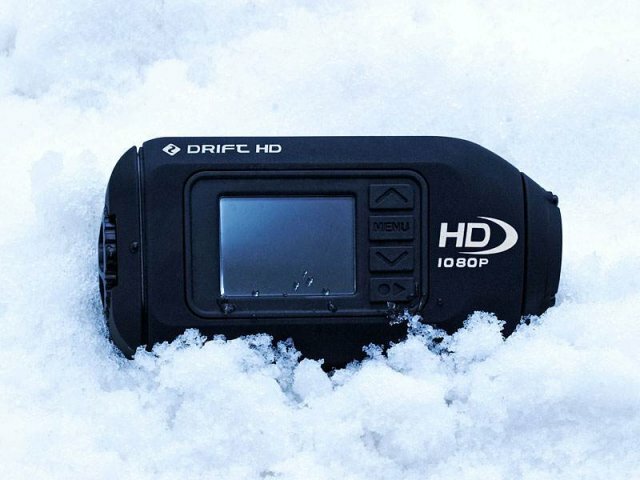 It’s water resistant enough for any snowboarding outing so you don’t need the waterproof case accessory unless you want to film a pond skim. 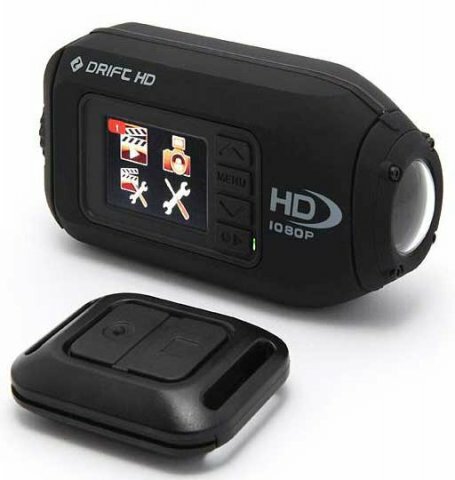 The new Drift HD is much smaller, weighs less and mounts much better on helmets goggles and mono-pods. It has a replaceable lens so if you break it you just order a new lens instead of buying a whole new cam. It comes with 2 back hatches. A normal screw top and a screw top with inputs. It doesn’t make the steep run look like a beginner run. It’s still a little fish eye at the wide angle but it’s not terrible. If you want your viewers to get a better idea of the steep terrain you are riding then you can adjust the zoom so it doesn’t look flattened by the fish eye wide angle lens. It has all the old features the Drift Stealth has. 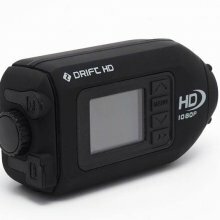 Take our review of the The Drift Stealth, add these features mentioned above and you have the Drift HD review. 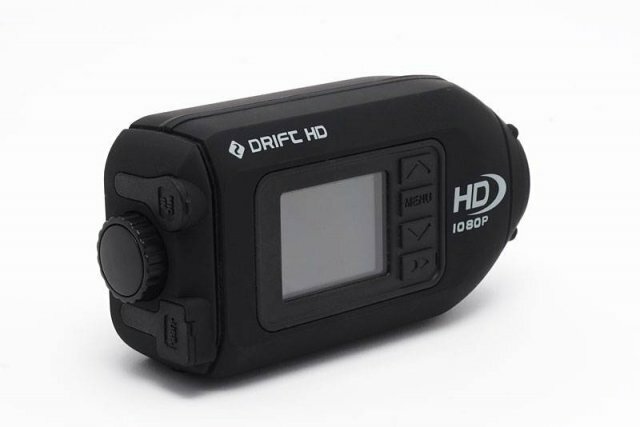 When the Drift HD is on your helmet, goggles, or mono pod it looks and acts much smaller than the GoPro. The Contour wins on the low profile battle for side mounting on your helmet or goggles but the Drift is pretty close now with it’s new design. 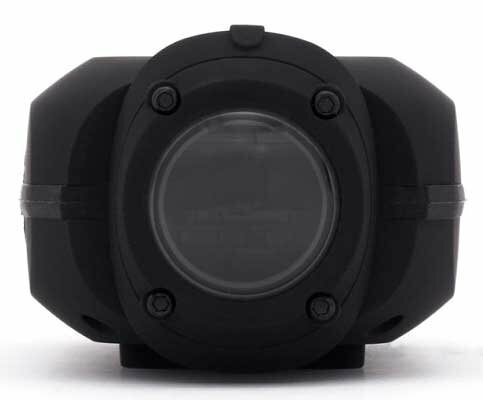 The Drift takes it for top mounting on your helmet or mono-pod mounting. 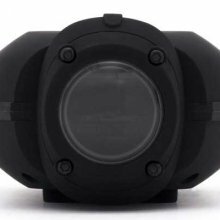 It has a much lower profile and can adjust to just about any way you want it on your helmet, goggles or mono pod over the Contour. 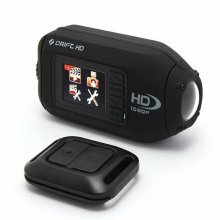 The GoPro looses in every category to the Drift HD and Contour when it comes to mounting by a lot. I (editor) don’t speak for everyone here at The Good Ride but to me the site of a GoPro on top of the helmet or head just looks horrible. I could never permanently mount one of those things on my helmet. We all loved keeping the Drift in our pockets and popping it into a helmet/goggle mount when it’s time to film. Actually this year our favorite thing is just keeping it in a Jacket pocket mounted to a mono pod. We could easily pass it around and just put it back in a pocket when we are done. none of us looked like we have a second voodoo computer head. Our only complaints are the buttons on all the Drift Camera’s aren’t as easy to push as others out there and especially with gloves on. The remote buttons are easier with gloves but still not ideal. When you have gloves on it is not easy to find the button on the camera but easier with the remote. The other complaint is the new Drift HD seems to only take a micro SD card instead of an SD card but this is minor. The settings are easy to access and not terribly hard to dial out or access. 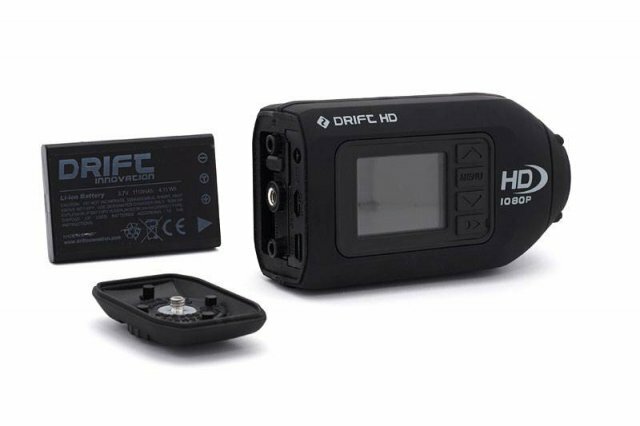 Before the Firmware update the drift would go change exposure while filming. It would go from light to dark without a reason and it kind of ruined the video. After the Firmware Upgrade this problem went away so no big deal. Also the image quality seemed to improve after the firmware update. In all lighting the Drift seems to have more natural colors where the Go Pro and Contour seems a little washed. Low Light isn’t ideal but it’s ok. When it comes to being able to make out minor details of the image the Go Pro seems to be the winner while the Drift is second in about the same place as the Contour. Over all the image quality is lacking a bit compared to the other cameras. With all three cameras it seems that everyone loves the 1080p 30fps setting but we found that the 30 frames per second with all cameras makes snowboarding down a hill a little jumpy. When we shifted to 720p with 60 frames per second we found it smooth and much better for the jarring up and down action that happens when you are snowboarding. With all the cameras you loose a little clarity with 720p at 60fps but the video quality is smoother. Who cares about the other video options. All in all the Drift has the most important quality for a snowboarder and that is superior low light video over the other cameras. One of the biggest complaints we have with all action cameras is their wide angle lens makes even the steepest run on the mountain look like it’s an intermediate run. 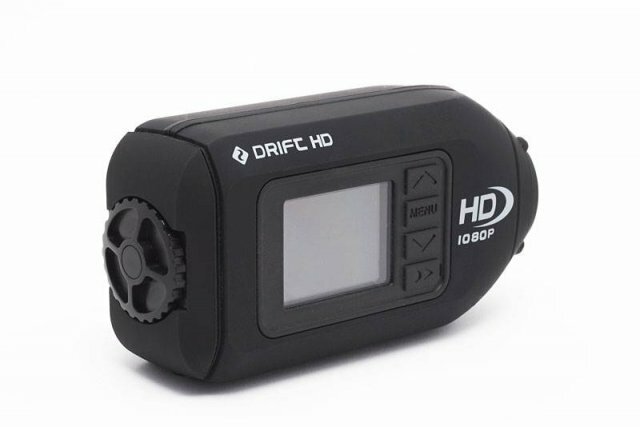 We aren’t saying that Drift doesn’t do that same thing but the runs are closer than they appear in real life compared to the Go Pro and about the same as the Contour when in the wide angle mode. When you zoom all the way you get rid of a lot of that fish eye look and you get a better idea of the severity of the run you are on. The Zoom on the Drift gives the camera a distinct advantage over the Contour and GoPro here. With the Zoom it’s also a lot easier to film your friend at a safer distance and for those who enjoy a reasonable amount of safety this is a plus as well. The mono-pod accessory is a must when snowboarding. Once you get use to it’s a better way to film compared to a helmet mount. We found the Drift Mono-pod to be sturdy and a very stable video mount. We’d like to see this extend out about twice as far so you can film more of yourself and follow your friends further away. We’d also like to see a rubbery ultra grippy material where you grip this thing so you feel more confident with gloves on. It has a little leash but that could be bigger as well so you can work with gloves. 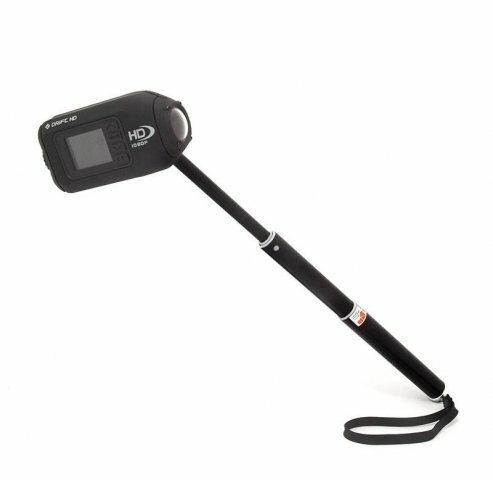 We found this mono pod to be the most sturdy and best to mount but the X-Shot Mono-pods easier to film yourself and others with. 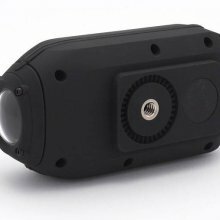 If Drift just made this mono-pod longer it would be very usable and versatile like their camera. Instead its mainly good for filming others. We tried many after market cases but ended up much more happy with the Drift Case Accessory. It just holds everything very well and makes it very easy to organize all the essential mounting kits. We’d love to see a few loops on the outside to carry the mono-pod and feel that would make this case practically perfect. We at The Good Ride were looking for “the best snowboarding action camera” out there and to us this clearly won. 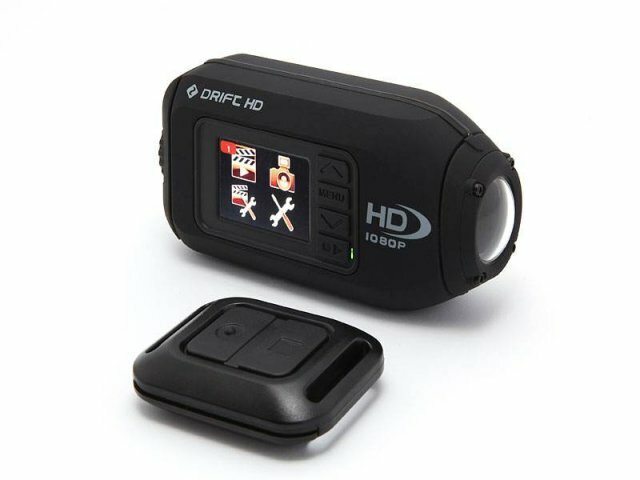 The smaller camera, remote control, numerous easy to mount options, LCD screen and especially the zoom option easily made this the best Action Camera option out there for snowboarders. We liked this camera so much we chose this as our dedicated camera to film our days on the hill with. 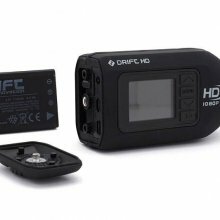 If you want a camera primarily for snowboarding then the Drift is hands down the best call. If you are a skier then it’s all about Contour. GoPro just doesn’t seem to be the best option for either unless image quality is the only important thing to you. We try to get as many images of the Drift Innovation HD, but forgive us if they're not all there.